Such a loser. I rolled up to Portland and had many beers with A23, I mean Old Nevermore, AND Oldschooly. Guess I'm the only one not getting old. But I am a loser due to the fact I had planned to take a dozen tins with me and in the excitement of the Wife's Moms moving in to housesit and getting on the road and blah blah blah. Forgot the tins and was later disgruntled about it. So to the Pantry I go. I received two shipments smuggled out of Turkey. The first, ahh the first with it's Giant Round Tins... they shall wait for another day. The second was brought back by Friends of Becky's. Thank you Friends of Becky's. 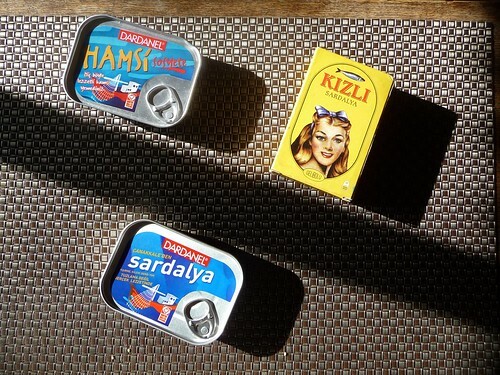 Two tins from Dardanel, but as it turns out one is Hamasi Sosyete (Anchovy Society, I kid you not, that's how it translates). 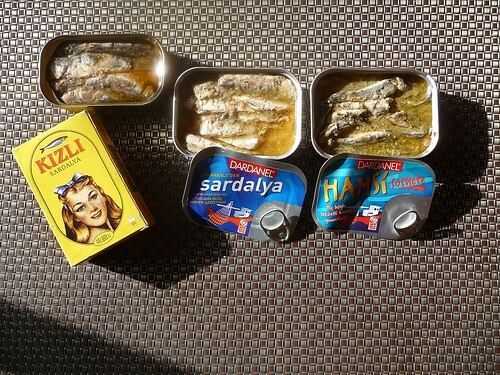 The Sardalya tin is in Sunflower Oil with a bit o' salt. 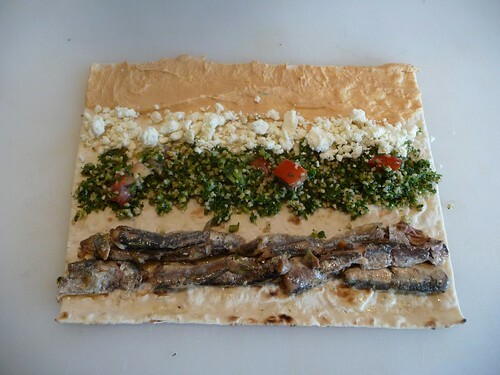 The Kizli (girl, daughter, blonde, woman) is from the Gelibolu region, produced by Alaeddin..
Let's start with the anchovies. They are not the anchovies Your used to. These are not for Your césar salad. Actually, these would be quite nice with a césar. They are prepared just like sardines. I don't taste any smoke but they have tiny vertebrae and a nice sweetness. Maybe sixteen fun and yummy fish in a clean oil. We had already eaten four or five by the time the above picture was taken. 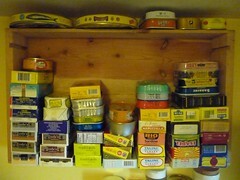 Four out of Five Tins. I know these are unobtainium and if they were delicioso I would tell you more. 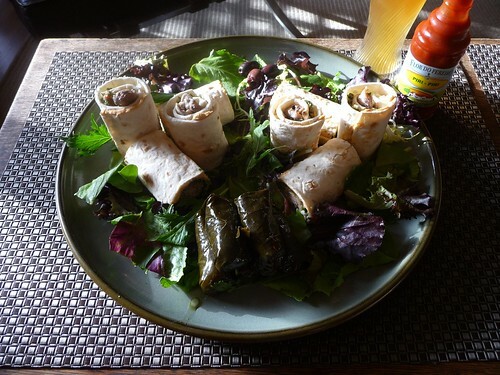 The Dardanel Sardalya are not pretty, have light smoke, tasty vertebrae and are just OK. The Kizli are tiny tots and nothing directly good or bad about them. Light smoke, verts, fairly firm, clean finish. But not wowzers. They both are calling up Three out of Five Tins. 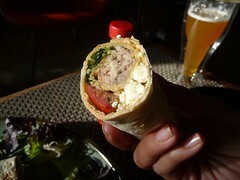 I rushed through that, no really I did, so I could tell You about the aram style sandwich. Spread it thin. Roll it up. We didn't take the time to plastic wrap and refrigerate them (as recommended). We just got to them. 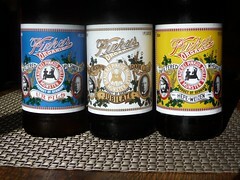 I looked around for Turkish Beer and brought home the Pinkus Trilogy (USDA Certified Organic). Turkish Tins, a nice change up after all the fast balls. If you know someone going to a Sardayla Sosyete meeting, get a few. nyway, thank you for visiting my website. Never tryed it..is it worth?